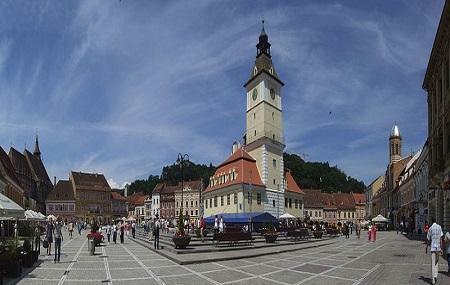 Located in the historic part of Brasov, the Council Square was originally used as a marketplace since the 14th century! With the buzzing market being an important place of commerce, many merchants and traders from all around the world came here for business. As the place was a prominent spot in the town, it was also used as the spot for punishments (the central pillory was were the accused would be punished!). It is believed that during the times when witchcraft was a problem, many women were accused of being witches and it was here that were punished. Stefan Stenert was also beheaded in 1688. A story also goes that the Pied Piper of Hamelin (yes the very same one who got rid of the mice in the fable story) appeared here at the Brasov square! Today, the medieval buildings that surround it have made the entire square a historic treasure. The Council House seen here dates back to 1420 and currently accommodates the BraÃ™ov County Museum of History. Other buildings surround the place including the Black Church, the Orthodox Cathedral, Judiciary Hall, MureÃ™an's House, the Hirscher House, and the Strada Sforii. A fountain, art work and the vintage lamp posts and cobbled stones- all spin their magic to form a whole different world. A number of restaurants also surround the square and are apt for dropping by for a meal after a stroll around. At night, the restaurants and buildings light up to make this one of the most romantic pockets around the city. Timings of individual attractions around the square, vary.